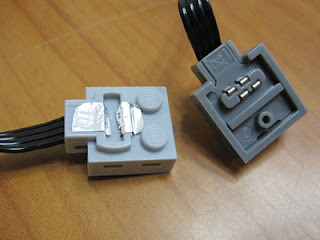 TBs has already hosted two stories about how to connect an IR-Receiver to a standard 9V LEGO battery box. The trouble with the IR-Receiver is that it doesn't draw its current from the same wires as the motor and so the extension/conversion wire doesn't work in this case. Today I tried my hand at a solution proposed by Rob Hendrix (Brickmodder) in BrickJournal 7. Make sure to carefully push the bent black wires between the metal forks that are the bottom part of the connectors. Then place the 9V bottom part on top and press hard to close. Check to see if all the connections are good by using your modified connector to hook an IR Receiver up to a 9V power source. Disconnect and reverse polarity immediately if the IR-Receiver's little green light doesn't go on, as you might damage it if exposed for too long to the wrong polarity. it looks there is enough space for some diodes. It could be best option. I don't think there is any space to add extras. Keep in mind that the bottom part needs to fit in and that takes up what looks like free space to the sides of the wires. Also, in the second image of the opened connector you can see the four connector 'forks' and two additional notches. That's where the 'forks' you can see on the bottom piece fit in. Or would you short the connectors in a different way? If you ever do, please let us know and send some pictures. 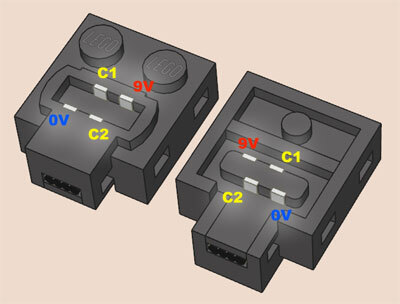 SMD diode diameter is 1,45mm-1,6mm. Lenght 3,5mm. I wanted to contact any of the editors of this blog (AVCampos ; Jetro ; Conchas), to ask your opinion about a new Technic website. btw : my name is Clement, 23, France, aka "JakoB" on Brickshelf. The contact can be found through the profiles. Have sent you e-mail meanwhile JakoB. My bad, the end is fr, not com. Sorry.